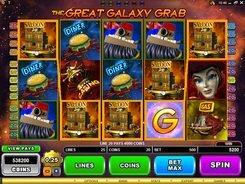 In this three-reeled one-payline slot from Microgaming, aliens are not at all scary. Instead, the yellow-dotted E.T.’s will shower you with money all the way. 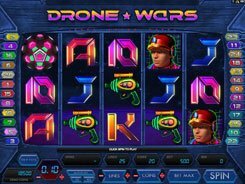 The base gameplay takes place on three reels and a single payline. The only setting you can configure before a spin is a coin value that varies from $0.1 to $10. The slot employs a classical set of icons, such as cherries, lemons, plums, bars, bells and sevens. Winning combos created during the base game award you a certain number of “winspins”. For matching up three fruit symbols on the payline you get right up to 5 winspins. 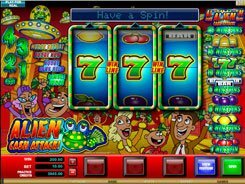 The Alien Cash Attack logo brings you the slot’s maximum of 25 winspins. 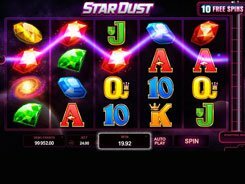 You are then taken to another set of reels, with 3 reels and 5 paylines with guaranteed cash prizes and high multipliers reaching x500 times a bet. 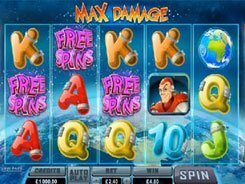 The slot has very lucrative Nudge and Hold features enabling you to spin one selected reel whilst holding the remaining ones, or spin all reels whilst halting one of them. Alien Cash Attack is an absolutely quirky game with tons of fun and great chances to score big. PLAY FOR REAL MONEY!